Our team of expert has researched some of the most popular best weight loss tools. We hope you find these tools interesting, useful and motivating. Think of the last time when you exercised a lot or cut down on food yet you felt stuffed. It can happen that you do not know the reason for your increase in weight and want to get rid of it completely. The tools you will find below are going to make losing weight simpler and easier. Not only for weight loss, the tools will keep you safe from cancer, type 2 diabetes, high blood pressure and heart disease. The tools will assist you in reducing the number you see when you step on the weighing scale. A fat burning belt, also known a slimmer belt can help you eliminate the excess fat of the various parts of the body. It can heat up your core and help you keep your lower back warm, which can relieve some back pain. A slimmer belt is usually made of soft and stretchy, but rigid material. Wearing the slimmer belt on a daily basis can help you sit straighter, which can lead to a reduction in back pain. Wearing a tight belt around your middle can help you remember to keep your core engaged and head to the gym after work. There, you will exercise and keep your core tightened, which can help you see a difference in the size and shape of your waist. This will make you look slim in any of your dress. A stationary bike is more likely to help you lose an extra belly fat than crunching your abs. Indoor cycling at home is one of the most effective exercise gym equipment. Do this workout by pedaling a stationary bike at an effort that raises your heart rate to between 50 percent and 70 percent of your maximum. Try this for at least 20 minutes. You can take 10 minutes break and restart again. Go for 20 to 30 minutes at this higher intensity that raises your heart rate to about 75 to 85 percent of your maximum. You’ll be left huffing and puffing and build up quite a sweat, but the effort will be worth it when you see your girth go down. You will gain benefit by doing this cycling every day at a specific time that will burn your calorie gradually. A rowing machine when used correctly can aid in burning fat more than any other machines. It is true that most people make mistakes on this tool so if you can utilize it properly, you will be burning optimum levels of calories and fat. There is nothing to be embarrassed about when you make errors using this tool. Start by adjusting the damper. If the lever is set to a high setting, it will make you feel weak and reduce the exercise time. Although the duration states only half an hour, as you master the techniques, increase the time to more than an hour. Do not just use arms but legs and shoulders as well. Start by pushing the legs then move the hips back so that the shoulders can pass the pelvis. You should not hunch or roll but your back should be straight. Your posture should be good and not sway back or bend over. A dance rug is a rug that can be connected to a TV or computer to dance. When the arrow is moving, it will jump to the corresponding position. Generally, each song has high, medium and low – these three kinds of choice. Dancing blanket is a good aerobic activity because with once you get into the groove, your body will automatically feel the rhythm to move. 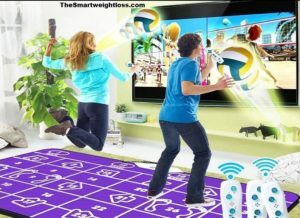 In general, with the dance mat, heart rate will be controlled within 100 ~ 120 times/min. This will be fun once you get used to it. This will gradually burn your calories and boost your mood. Dancing will make you happier, smarter and healthier. This rope is not an ordinary rope skipping but has a good stretch elastic rope. Moreover, the elastic rope is light in weight and easy to carry and so has become very popular. You can do exercises with elastic rope literally anywhere! This portable exercise equipment is also easily stored, making it perfect for home use, hotel workouts, or when you’re tight on space at the gym. Grab one end of the resistance band in each hand and stretch it across your upper shoulders (the band should be under your armpits). Get into pushup position with your feet together, holding the ends of the band in place with your hands. Lower your body to perform a full pushup. Work up to 15 reps in a row. A dumbbell is one of the most traditional, most affordable weight loss tools. As long as there is a pair of dumbbells and a bench, you can carry out a variety of bodybuilding training. Scientific use of dumbbells can help you receive a good weight loss. Dumbbells are specifically good for back, shoulder, leg, arm and chest workouts. You can burn fat and have lean muscle with a pair of dumbbells. Lie flat on the bench, hold the dumbbells directly above chest, arms extended. Lower the dumbbells to the chest in a controlled manner. Press dumbbells back to starting position and repeat. Avoid locking elbows. Do this for 10 minutes. Then, Sit upright on the bench with dumbbells overhead. Make sure back is flat. Lower dumbbells slowly to shoulders. When arms are at 90 degrees, press the dumbbells back up and repeat. Do this for 10 minutes more. Take a break of 5 minutes if you want. Later on, Stand upright, feet shoulder width apart, knees slightly bent. Bend lower back and knees to lower the weights down your legs. Back must remain flat, lower back should be arched inwards slightly. Keep head up throughout the exercise. Stand upright using lower back and legs, maintaining flat back and keeping your head up. However, dumbbell training might be boring sometimes. It is recommended to put some music during training to increase the fun. Although many people find exercising on a treadmill to be boring, you have no other option if you are thinking of a fast calorie burning solution. To get rid of the boredom, you can distract your mind or take breaks. Do not worry because it will not be difficult for you if you are not putting too much pressure on yourself. The pace at the beginning should be 5MPH and there should be a calorie meter so you can keep your eye on that. Slowly increase it to 7MPH for three minutes because you lower it again to 6MPH. You do not need to maintain a high pace because it will make you tired and weak. Fantastic goods from you, man. I have be mindful your stuff prior to and you are just too great. what you’re stating and the way in which during which you say it. I’m so glad that,you find it helpful.